Managements of many industrial parks and export processing zones in HCM City have built dormitories for employees, but only a small fraction of the workers choose to stay in these places. 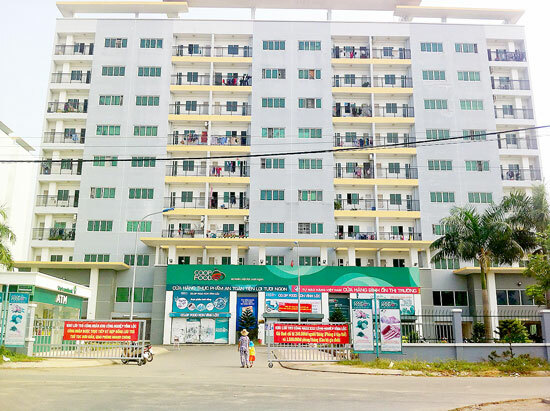 According to the HCM City EPZ Authority (HEPZA), 14 dormitories have been built at eight IPs and EPZs since 2006 to provide accommodation for around 18,000 employees. Nissei Electric VN based in Linh Trung EPZ No 1 in Thu Duc District is a company that provides accommodation for a large number of its workers. Its dormitories house 2,280 workers with facilities like fans, washing machines, showers, computers, karaoke systems, gymnasiums, and badminton and volleyball courts. Each 24sq.m room, which is equipped with sedge mats, mosquito nets and blankets, accommodates a maximum of six workers. The workers get free accommodation but have to pay VND20,000 (nearly US$1) a month for water and electricity. The dormitory at Linh Trung IP No 2 has 353 apartments including 35.sq.m houses for groups of single workers and apartments of the same size for families. Every apartment has internet and cable TV services. There are also a kindergarten, shopping mall, outdoor stage, cinema, canteen and other facilities to help improve their living standards. Tan Thuan IP has three dormitories built by the South Sai Gon Development Co (Sadeco), Hung Way Ltd, and Duc Bon Ltd, which can accommodate 1,500 workers. Over 1 million people work in companies based in the city, half of them in EPZs and IPs. According to HEPZA, this year some 200,000 workers at these zones require housing and half the demand will be satisfied. However, several completed dormitories at Linh Xuan No 2, Le Minh Xuan and Vinh Loc IPs remain unoccupied because their investors have not decided on the rents since construction costs have not been verified by authorities. HEPZA says the city Department of Construction is responsible for assessing construction costs while the department says it needs guidance from HEPZA. Nguyen Quoc Vinh, head of HEPZA's Construction Division, says rents at some other dormitories are much higher than in nearby residential areas, making them unattractive. A perceived lack of freedom is another reason for IP workers to lease their own accommodation elsewhere. Vinh says some dormitories require tenants to return home before 10pm though many workers have to work extra and night shifts. A survey by the department found that 97 per cent of workers polled did not like living in dormitories because they were prohibited from bringing friends and relatives in. Seventy per cent also said the dormitories were uncomfortable because so many people shared a room. Hundreds of families in the Mekong Delta Province of Dong Thap have leased lands in the Cambodian border province of Prayveng to grow rice. According to figures released by the Dong Thap People's Committee last week, the number of families from Dong Thap leasing land in Svayreng rose from some 200 during the 2013 – 14 winter-spring crop to 464 this year. The total area leased by them has risen to nearly 2,200ha this year from 1,200ha. The figure is expected to rise further to 2,750ha next year. Most of the people live near the border in places such as Hong Ngu town and Tan Hong District. This year over 13,800 tonnes of paddy grown on these lands will be exported to Viet Nam and the rest sold locally. Korean group Samsung is all set to begin construction of an electronics manufacturing plant on a 70ha area at the Sai Gon Hi-tech Park in HCM City's District 9. The US$1.4 billion Samsung CE Complex project for research and developing and producing electronic products using advanced technologies, will begin operations in the second quarter of 2016. In the first phase it will focus on production of high-tech television sets before turning to other home appliances. Samsung's latest project in Viet Nam is targeted at serving export markets in the region and world-wide. According to the plan announced by Samsung when receiving the licence from SHTP authorities last October, the complex will also produce air conditioners, refrigerators, and washing machines in future. This is Samsung's second project with an investment of over $1 billion in Viet Nam. In July last year Samsung Display got the licence for a $1 billion project to research and develop high-resolution screens in the northern province of Bac Ninh. This is also the second billion-dollar project at the SHTP after Intel's in 2006. The Samsung plant is expected to spur the city's exports and domestic production of high-tech products and also improve the quality of the workforce. Samsung, which first came to Viet Nam in 1995, has built two mobile-phone and electronic devices manufacturing complexes in the northern provinces of Bac Ninh and Thai Nguyen. These projects employ nearly 60,000 workers and generate huge export revenues. "This [complex in HCM City's Sai Gon Hi-tech Park] is a hi-tech complex similar to those in Bac Ninh and Thai Nguyen, specialising in products for the global market," Nguyen Van Dao, deputy general director of Samsung Vina, told a meeting in Da Nang last week. "This complex will manufacture the top Samsung TVs." Since late last year around 35 per cent of Samsung mobile phones sold globally have been made by the company's factories in Viet Nam. The ratio is expected to rise to 50 per cent soon.